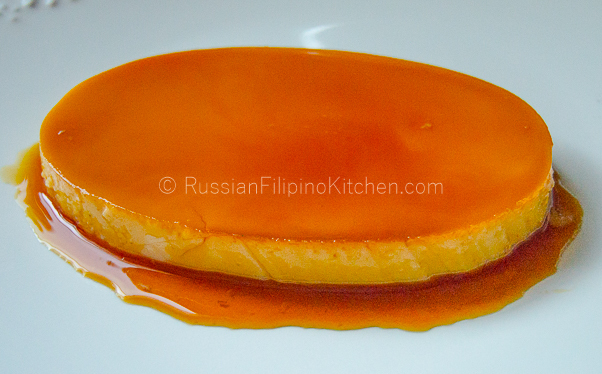 Leche flan is the Filipino version of crème caramel, the French custard dessert made from eggs and milk. 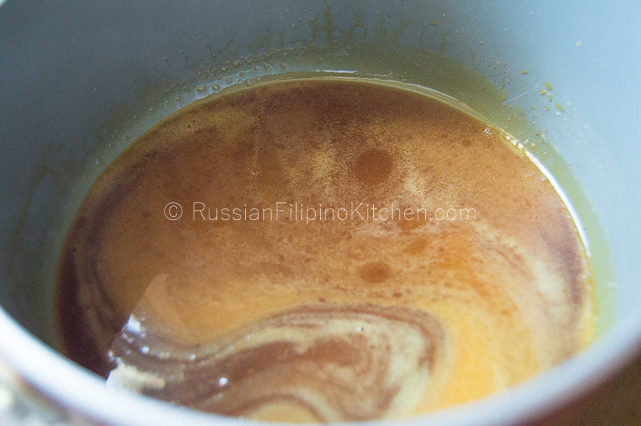 It has a layer of soft caramel on top and smooth custard on the bottom. As one of the most popular dessert items in the Philippines, it is usually served during parties and special occasions. My quest for the perfect leche flan recipe (Filipino style crème caramel) came about after my dear friend Evelyn moved to a different city months ago. I admit I was quite spoiled by her delicious cooking when she was still living close by. We usually spent time either at her house or at my place and cooked while we babysit our kids. I missed those times and now I miss her sinigang and leche flan the most. Her leche flan which was water-bathed in the oven was rich, smooth, and melt-in-your-mouth delicious! In her absence, I was determined to figure out how to make it myself. Filipinos traditionally cook the flan using a steamer since not many households in Philippines own an oven. The food is being cooked by steam generated by hot water on the bottom of a steamer basket. The pot has to be covered tightly with a lid so the steam doesn’t escape and cooks the food thoroughly. I was unsuccessful making my first leche flan. Even if I mixed the ingredients well, strained the mixture (only once), poured into individual tin molds, covered them with aluminum foil, and steamed on high for an hour. The flan had tiny holes all over and the texture wasn’t smooth. I figured I screwed up somewhere in the mixing or probably in the temperature. So I did it again, this time paying careful attention to every details and steps. On my second try, I avoided beating the egg mixture, rather stirred it gently using a whisk, then repeated the same steps above. Again, I didn’t get the consistency and texture I wanted. So I had to keep trying until I got it right. On my 6th attempt, I finally able to figure it out and share with you some important tips on how I made my steamed leche flan smooth and creamy. • First, you need to be careful in mixing the egg yolks and milk. Do not beat the mixture. Rather give it a gentle stir in a clockwise or counter-clockwise direction, whichever you prefer. Beating creates air bubbles which show as tiny holes on the custard. 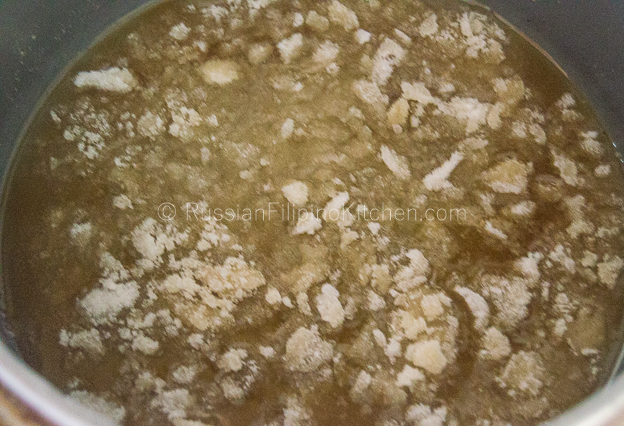 • Strain the mixture at least three times (or more if you’re up to it) until most of the impurities are removed. This is the ultimate secret to achieving the smoothest leche flan. • The size and thickness of the mold affects cooking time. The smaller the mold, the faster it cooks. In my experiment, I only use the traditional llanera specifically designed for leche flan, so I can only vouch for them. But I believe if you use different molds made of heat resistant plastic, glass, or ceramic, the same rule applies. • Steam on low heat. That means set your stove dial to like a 2 or3. Make sure that the water in the steamer is boiling but only with few bubbles (simmering). Boiling on high causes tiny holes on the flan, especially around the sides. A gentle steady heat will help you achieve the desired result. 1. Prepare molds for leche flan as you will need them as soon as the caramel is ready. 2. Place sugar in a sauce pan and dissolve over low heat. Stir constantly and pay attention as it melts; you don’t want to burn it. As sugar turns to light brown, turn off heat. Divide and transfer quickly to individual molds. If you’re using a llanera, use a kitchen tong to hold it as you’re pouring the caramel because it can get very hot. Tilt the mold when needed to distribute evenly on the bottom. Set aside to cool and harden while you prepare the egg-milk mixture. 1. 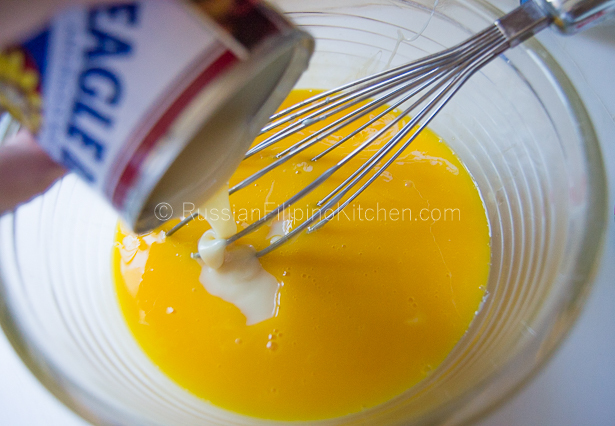 Place egg yolks in a large mixing bowl and stir gently in a circular motion using a whisk. 2. Add the condensed and evaporated milk, and mix gently. 3. Pour in the vanilla extract or lemon zest and continue mixing until smooth. 4. Strain the egg-milk mixture using a fine mesh strainer. Do this at least 3 times until most of the impurities are removed. 5. Use a ladle to pour mixture into individual molds. I used three llanera in 3 different sizes: XL, large, and medium. 6. Cut aluminum foil just enough to cover each mold. 8. Place leche flan molds into the steamer, cover, and steam for 25 minutes for medium llanera, 35 minutes for large, and 1 hour for XL size. To check for doneness, insert a toothpick into the mixture. It should come out clean. Remove from steamer and allow to cool, still covered. Once it reaches room temperature, refrigerate overnight to help set. 9. When ready to serve, run a knife around the edge, invert into a serving plate, and cut into serving portions. Prepare molds for leche flan as you will need them as soon as the caramel is ready. Place sugar in a sauce pan and dissolve on low heat. Stir constantly and pay attention as it melts; you don’t want to burn it. As sugar turns to light brown, turn off heat. Divide and transfer quickly to individual molds. If you’re using a llanera, use a kitchen tong to hold it as you’re pouring the caramel because it can get very hot. Tilt the mold when needed to distribute evenly on the bottom. Set aside to cool and harden while you prepare the egg-milk mixture. 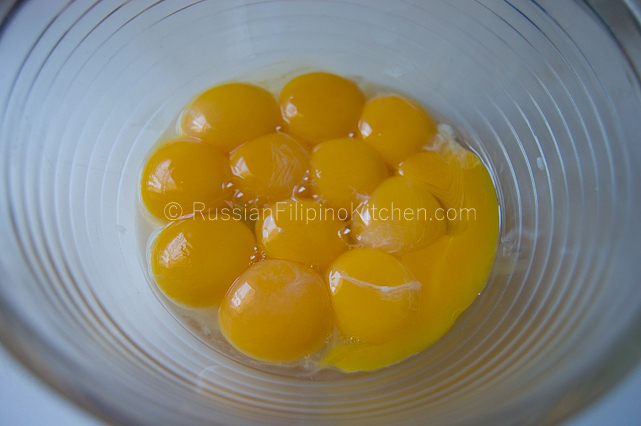 Place egg yolks in a large mixing bowl and stir gently in a circular motion using a whisk. Add the condensed and evaporated milk, and mix gently. Pour in the vanilla extract or lemon zest and continue mixing until smooth. Strain the egg-milk mixture using a fine mesh strainer. Do this at least 3 times until most of the impurities are removed. Use a ladle to pour mixture into individual molds. I used three llanera in 3 different sizes: XL, large, and medium. 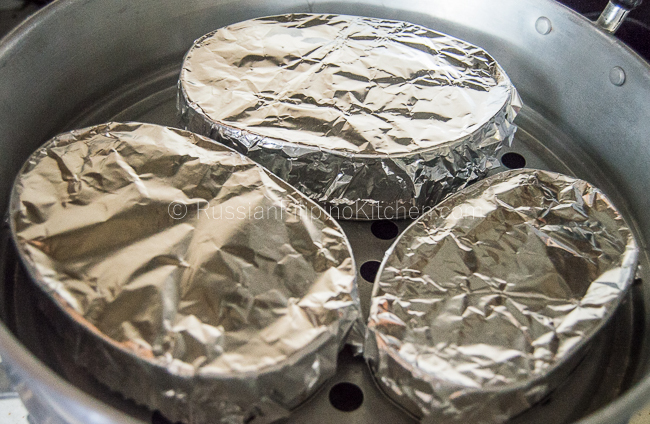 Cut aluminum foil just enough to cover each mold. Place leche flan molds into the steamer, cover, and steam for 25 minutes for medium llanera, 35 minutes for large, and 1 hour for XL size. To check for doneness, insert a toothpick into the mixture. It should come out clean. Remove from steamer and allow to cool, still covered. When it reaches room temperature, refrigerate overnight to help set. When ready to serve, run a knife around the edge, invert into a serving plate, and cut into serving portions. Sorry for the late reply, I just saw this comment. I will make this version of leche flan as I am trying out more leche flan recipes especially the ones using whole eggs. It’s been in my family for years. I’d love to hear what you think. Yes, I’ll let you know once I tried it. hi gud pm tita mia.can you please explain to me whats the secret of producing a smooth texture leche flan??. we made a leche flan in our school and we’re about to answer the question. Hello Karen! Your question can be answered within the blog post itself, just before the recipe. Thanks for checking out my blog. This is a sensational entry. I can’t wait to attempt this, although I must admit my sister is the leche flan professional. Hehe. We have searched high and low and found all the ingredients we need for halo-halo as a special christmas dessert. Yummy!! Thanks! I hope you were able to make the halo-halo and enjoyed Christmas celebration with your family! I tried this recipe and on my first attempt it was perfect! Thank you so much for all the tips! Glad to hear that, Hazel. Good luck on the business venture! Hello Yen! I haven’t tried making leche flan yet using the water bath method in the oven, so I can’t tell you exactly the temperature settings for baking. However, I’d suggest going with 300ºF and bake for about an hour. Hope it helps! Hi! Thanks for sharing this leche flan recipe of yours. I did this yesterday, followed each steps & everything went well except for the flan itself. It was smooth but it had bubbles around it. It could be the temperature that made it like that. What do you think? I think because when I was steaming the flan, i turned the heat low but still boiling. It should’ve been just simmering not boiling. Hello, Nick! That’s right. It should be simmering, not boiling. Low and slow, that is. Good luck on trying next time. Hope it’ll be perfect! Hello Mitzi! Did you let the flan sit in the fridge overnight? It needs time to “set” so the caramel will stick properly. I’m guessing you went ahead and invert the leche flan right away as soon as it was done steaming? Or am I wrong? Please contact again if you need help. Regards! Hi! Your leche flan looks delicious! Bakit kaya yung gawa ko umalsa at may mga holes. Hindi siya smooth. First time ko kasi gumawa. Malakas din kasi ang apoy o di kaya sa paghahalo ng mixture ang problema? Hello Rubi! Basahin mo mabuti yung intro nung recipe kasi ini-explain ko panu ma-achieve yung smooth texture ng leche flan. First is yung mixture, dapat salahin mong maigi tapos remember pag nag steam na, dapat hindi boiling yung water kundi konting kulo lang or simmering (hindi malaki yung bubbles). Hope next time ok na yung finished flan mo. Good luck! That’s okay…Minsan super excited tayo gumawa ng recipe derecho na tayo sa steps. But I’m glad nabasa mo yung intro! Hi Ma’am Mia, i tried different procedures and a set of ingredients for a year coz i’m planning to have a business with this food, but i haven’t tried this one, i’ll try it, and i’ll let you know the result..tnx for sharing us your recipe. Your recipe looked easy to follow. Will try it for sure. Thank you. I will try this recipe for christmas.. I hope i can make it smooth and creamy like yours.. Thanks for the shares. You’re welcome, Rica! Thanks for the feedback! Mia this is what i need this new year a delicious Leche flan ..thank you very much.. Advance Happy New year to you and the whole family .. Thanks, Eden! Hope you love it. Happy new year too! Looks delicious!I will try this recipe….thnk u so much! You’re welcome Joylyn! Hope it turned out great! Hello Dancel! It does make a difference, but the most important thing is cooking the flan over low heat too! Hope you’ll perfect making the flan next time 🙂 Good luck! Thanks for the recipe! I have tried it yesterday, i don’t have a steamer so I used our very own Kitchenatics cooling and baking rack that can be bought in amazon. I am amazed with the result! I baked it 375 for 50 minutes, I put the rack to a half inch pan then put it in the oven before i set the oven to 375F then I pour about 4-5 cups of water, when the heat’s in 375, i put my flan there wrapped in foil on top and set for 50 minutes. The flan is perfect! it has the same consistency as to steaming it. This recipe is perfect! Oh, i actually added a little lemon zest on it for more aroma. Hello Lovely! THanks for this valuable information. I actually haven’t tried this method yet, but I will definitely do in the future! hello tita! Pa ano naman nung leche flan sa mang inasal. Taga nevada po ako but im craving for leche flans and i dont know where to buy. Yung leche flan po sa mang inasal is so creamy and sticky. Hindi mo yung gumagalaw na parang gelatin ? Thanks! Mine was a bit ok, the taste is perfect as well as the texture. But after 5th attempt still there was this holes all over its side. I followed everything. What went wrong i dunno? Hello Lizzy! Did you steam it on the lowest heat setting? In my experience that should solve the problem. Hi Ms. Mia..itanong ko lang kung dapat bang ilagay muna sa fridge Yong llanera with the leche flan after steamed? Or pwede bang ilagay agad sa plate ang leche flan right after ma.steamed? Kasi pi sa akin pagkatapos ma.steamed nilagay ko agad sa plate mainit init PA nga pero nagtaka ako bakit Yong caramel naiwan sa llanera? As dumikit talaga Hindi nadala sa plate. Bakit po kaya? Yong gamit ki kasi hi ndi cya llenara, non.stick Yong ginagamit sa banana loaf na cake. May kinalaman ba yon kung bakit Yong caramel nadikit? I am so excited to hear that, Kriselda! Thanks for sending your feedback. I really appreciate it! Hi.. Ive made leche flan same lng nmn sa procedure na ginawa mu ate.. But why is it my flan,tumitigas… Not that usually soft na leche flan.. Anu kaya problem? Sa cooking time po ba?? Been cooking leche flan for years.pero lagi may bubbles sa sides.i will try your step by step procedures.excited ? I mean when it starts to boil yung steamer then thats the time you put in the molds.and start timing for 25mins. Hi Abi! Yes, that’s correct. You start timing after you put the molds in the steamer basket and when the water is already boiling. Hope that helps! Hi ms.mia….ty kaayo.nway lingaw kaayo ko sa mga recipe. Ill try nya pud ang uban. Actually ryt now, M trying da loslos hehehe.I read that ur from cebu. M also from cebu….ty again…..
Hello Donna! Try adjusting the cooking time…Add 15 minutes more. Iba-iba kasi yung lutuan natin. Baka di pa masyadong luto yung mixture kaya hindi sya nag firm up. hello po good day, gusto ko lang po itanong ,kase po pag nagluluto ako ng leche flan smooth sya pero malambot, iba yung pagka lambot nya parang hilaw pero pwede naman makain kase smooth yun nga lang malambot.. tapos ang dameng parang butas butas sa paligid ng leche flan, paano po maiiwasan yung mga butas butas na yun sa paligid ng leche flan? tas po feeling ko kaya malambot kc mga 20 min. ko lang ata sya naluluto .. tas po yung apoy sa steamer sobrang malakas ,ganun po ako palagi magluto ng leche flan.. dati po ntry ko din na medyo matagal iluto yung leche flan siguro mga 30 to 40 mins. pero feeling ko na over cooked cia parang di na cia smooth tas dameng parang bubbles … gusto kong makapagluto ng perfect na leche flan kaya lang parang di ko magawa .. tama naman ingredients ko .. saan po kaya sa lakas ba ng apoy?o sa oras? okey lang din po ba na masobrahan ng gatas? kapag po ba nasobrahan ng mga gatas nagiging dahilan ba sya ng sobrang lambot pag naluto?? pki sagot po sana lahat ng mga katanungan ko please po .. salamat po talaga .. God bless ..
Hello! Andyan mismo sa post sa itaas yung explanation at techniques para maging malambot yung leche flan. Basahin mo mabuti kasi naka explain yun lahat. But to answer some of your questions, yes, kailangan mahina yung apoy. Simmer siya dapat (konti lang yung bubbles sa tubig) at hindi rapid boiling (malalaki yung bubbles while nagpapakulo). Tapos yung time nang pag steam, it matters yan. Check mo after 25 minutes kung nag firm up na yung mixture. Gumamit ka nang toothpick tapos check mo if wala na bang dumidikit. Tapos adjust mo yung time. Add 10 minutes more at check ulit. Regarding sa ingredients, i-follow mo yung tamang sukat kasi pag subra yung gatas, di sya mag firm up. Dapat balanse dapat. I haven’t tried it yet since I always use condensed milk & evap when I make leche flan every single time. So I can’t say for sure. But others have told me they tried using regular whole milk instead of evaporated milk and it turned out fine. You may want to give it a shot. hi miss mia!!! good day!! !itatanong ko lang po bakit ganun smooth and creamy naman po yung nagawa kong leche flan kaya lang po nag kakaron ng crack ang ibabaw … bakit po ganun??? Hi maam bkit po ung caramelized sugar ko mtigas parin sya even after steaming it? Hind po siya naging syrup instead buo syang caramel.,. Hi Anne! Di ko pa na experience ang ganyan. Panu mo ba ginawa yung caramel? Try mo lagyan nang konting tubig yung sugar before mo lutuin. Hope one of the readers can help out sa tanong mo. Hi Mia, would you know why water sipped inside the flan during steaming? I covered it with aluminum foil though. The steamer also has a cover. Thanks a lot. Hello Ann! Water condenses as you are steaming. I wrapped the cover of my steamer with a kitchen towel to absorb some of the water. Also, make sure that the mold you are using is wrapped tightly with the foil. Hello Jo! It doesn’t matter what kind of stove you’re using. Just make sure that when you’re steaming, the water is in a gentle simmer (konting bubbles lang) as opposed to rolling boil or malalaki yung bubbles sa tubig. Hope your next attempt is more successful. Cheers! Hello Jho! It doesn’t matter what kind of stove you’re using. Just make sure that when you’re steaming, the water is in a gentle simmer (konting bubbles lang) as opposed to rolling boil or malalaki yung bubbles sa tubig. Hope your next attempt is more successful. Cheers! I made this tonight 12 egg yolks, 1 can each of condensed and evaporated milk also I added some extra stuff. 1 tbsp each of vanilla, almond extract and 1 tbsp of orange liqueur also I added 1/2 a cup of heavy whipping cream. I am also baking it for 35mins @ 350 degrees I don’t know how to post a pic with my comment. Hi, Leilani…you can email me the pic at russianfilipinokitchen at gmail dot com or if you have instagram account, post the pic and hashtag #russianfilipinokitchen and I’ll check it out. Hope it the leche flan recipe turned out great!